“The Swan Queen glides your way and asks that you look at your reflection in the events of your life. She gives you the ability to see the beauty that has transformed your life from ignorance to wisdom. 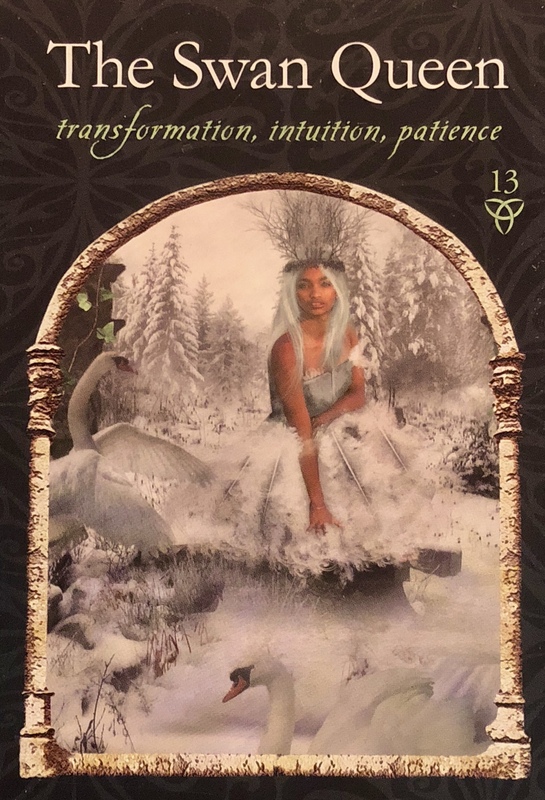 The Swan Queen lets you know that it is time to go within and seek the answers in your own intuition. Do not look outside yourself for answers now; the true power lies reflected in the still waters within you. Now is the moment to meditate and ask for a vision. The power of psychic perception is inherent in you, and the Swan Queen will help you dive deep into your query to find the answers you seek. As Challenger: “When The Swan Queen appears to challenge you, it is time to stop doubting your inner voice. Do not let your analytical mind prevent you from seeing the miracles that Spirit places in front of you. Another message The Swan Queen shows you in the mirror of your life is your fear of change. Why fear what is inevitable? Everything in life changes and transforms from one moment to the next. Holding on to the past only distorts and mangles the natural order of things. It’s time to take stock. And responsibility. Look around you and within you. What have you created and why? Do you see your patterns? What can you learn from them, and how can you turn away from the usual and have the courage to create something new? Is your story holding you hostage? If you were to release it, what else would be possible? So many questions to ponder, but so necessary to contemplate them if you truly desire to manifest your dreams instead of more of the same. The Swan Queen wishes to lead us through our issues of self-worth that hold us back. She holds a mirror up to you, asking you to see your beauty, both inside and out. See your strength, your courage and your truth. Use these to more into the next chapter of your life. Change is coming and if you are to make the most of it, you must learn to expand your vision. Shift your perspective of what you think is possible for you. Open up to receive the gifts of the universe and know that when you surrender to the change, and go with the flow, amazing things happen.